Codenvy is a cloud-hosted or locally installed multi-tennant workspace creator for teams interested in project and data management. Users are invited to collaborate and to use their production source codes and dev tools to create their own Docker environments. Codenvy excels at complex topologies, which means that the user can choose between several types of architectures, including multi-container, multi-tier, shared and micro servers. The customizable infrastructure also allows users to automate existing workspaces, and use permissions to onboard their teams. Developers can use any IDE, including their local ones, while managers can monitor and control the system’s performance, functionality, and availability. 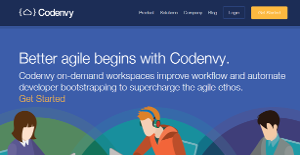 To make matters even better, Codenvy is a well-integrated and reasonably priced tool that can be used by teams from all scales and industries. Codenvy offers an easily customizable and programmable infrastructure where companies can create their own workspaces, control the system’s performance, and collaborate in a private and secure environment. This sophisticated data deployment & agile development system allows users to choose whether to host their workspaces in cloud or on their local servers. The cloud-hosted workspaces are operated effortlessly, and controlled with multiple APIs and extensions. Thanks to it, users can automate their workspace lifecycle, create runtimes and Docker stocks, and integrate their own version controls to define their resource limits. As we already mentioned, developers are invited to use any IDEs they want, including the Eclipse Che cloud IDE and their local ones. Codenvy is also a powerful collaboration system with well-elaborated roles and permissions. Any member of the team can be invited to participate in the workspace before the code is merged, share it, or automate bootstrapping to supercharge the agile ethos. The ultimate result are unified workspaces, improved features, and faster feedback for improved business decisions. Since each company has particular business wants, it is sensible for them to desist from looking for a one-size-fits-all faultless software solution. Needless to say, it would be pointless to try to find such a system even among market-leading software applications. The clever thing to do would be to jot down the various essential elements that require consideration such as key features, finances, skill levels of workers, company size etc. Then, you should do your research thoroughly. Read some Codenvy reviews and investigate each of the other systems in your shortlist in detail. Such comprehensive research can make sure you reject ill-fitting applications and zero in on the solution that presents all the aspects you need for business success. Codenvy is priced at $350 per user per year. Special pricing scheme and open source packages apply to education, government and non-profits. Contact Codenvy for enterprise pricing information and more product details. We realize that when you make a decision to buy IT Management Software it’s important not only to see how experts evaluate it in their reviews, but also to find out if the real people and companies that buy it are actually satisfied with the product. That’s why we’ve created our behavior-based Customer Satisfaction Algorithm™ that gathers customer reviews, comments and Codenvy reviews across a wide range of social media sites. The data is then presented in an easy to digest form showing how many people had positive and negative experience with Codenvy. With that information at hand you should be equipped to make an informed buying decision that you won’t regret. What are Codenvy pricing details? What integrations are available for Codenvy?